Many Pacific Islands neophyte journalists face a baptism of fire. It often takes raw courage to be a journalist in the Pacific. DAVID ROBIE writes about media issues after recently ending a decade of journalism education in the region. 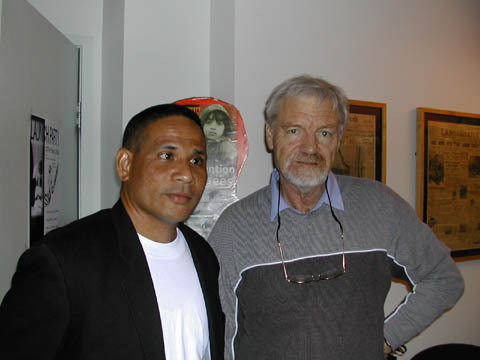 Duran Angiki, a University of the South Pacific graduate journalist and David Robie at the Public Right to Know conference at the University of Technology, Sydney, in September 2002. See Pacific Weekly Review, Sept 30-Oct 6 edition. BARELY two years ago masked Fijian gunmen seized a consignment of books from the United States bound for the University of the South Pacific journalism programme in Suva. The small cardboard box was stashed in a courier mail van hijacked by coup front man George Speight's supporters hoping to find hard cash. Two months later the carton was recovered by police from the ransacked Parliament and handed over to me; torn open but contents intact. Ironically, inside were six copies of Betty Medsger's Winds of Change: Challenges Confronting Journalism Education. This was a poignant reminder of the realities facing Pacific media. Politics in the region are increasingly being determined by terrorism, particularly in Melanesia; such as in Fiji, Papua New Guinea and the Solomon Islands. And with this development comes a greater demand on the region's media and journalists for more training and professionalism. Most journalists are young, relatively inexperienced and lowly paid. Since Speight's illegal seizure of Parliament on 19 May 2000, politics in Fiji has remained under the spectre of terrorism. While the Speight upheaval cost a relatively modest 15 lives--all Fijian--the fear of it happening again, and next time being even bloodier, is still a concern. Fiji's politics is driven by fear and a continuing threat to reinvoke terrorism if governments do not pursue a narrow particular direction, defined as ensuring "indigenous paramountcy". Fiji is already a country prone to having coups (three so far) and risks becoming consigned to a fate of economic, political, and legal instability; a "banana republic". Respect for the law is rapidly diminishing. Few people believe Speight will serve more than a token symbolic period of his life sentence for treason in "prison"; he is detained on the tropical isle of Nukulau off Suva, a former haven for local picnickers. Ten of his co-conspirators who pleaded guilty to lesser charges were given minor jail sentences (none will serve more than three years), while two--leading journalist Jo Nata and chiefly politician Ratu Timoci Silatolu--have denied the treason charges and at the time of writing await trial. The role of Nata --"I was just a public relations consultant"-- is at the centre of crucial issues in Fiji over journalism ethics, integrity, and independence. One of Fiji's first journalism graduates (at an Australian university), Nata was formerly coordinator of the Fiji Journalism Institute, a training centre established by media industry people that eventually closed under a cloud in 1999 about accountability over donor agency funding. Another Fijian journalist, Margaret Wise, sacked as chief-of-staff of The Fiji Times, has also recently been at the centre of debate over ethics and her paternity action against former coup leader and prime minister Sitiveni Rabuka. Editorial headlines such as "Don't shoot the messenger" highlight the hypocrisy in the Fiji media when defending perceived threats to media freedom. There is little debate about the quality of the media itself and whether the Pacific gets the critical journalism that it deserves. Other countries such as Australia and New Zealand have "mediawatch" style programmes on television and radio, and columns in newspapers, that vigorously question the media. News programmes also regularly invite journalism school commentators for views as they are independent from commercial interests. Such lively debate is healthy for improvements in the media. After all, the watchdog also watching to ensure it doesn't become a lapdog. "So much for the free (television) media in this country -- the debate always focuses on freedom from government interference.," Dr Emberson-Bain said. "What about freedom from the big (private sector) boys on the block with their vested interests?" While Fiji TV turned down her programme on spurious grounds, SBS TV broadcast it in Australia and bought exclusive broadcast rights for four years. It was also nominated in the best documentary category at the 21st Annual Hawai'i International Film Festival. After more than two and a half decades reporting and teaching journalism in the region, at times involving controversy, my most nerve wracking time was perhaps being twice arrested in New Caledonia during 1987 by French military forces, once at gunpoint near the east coast village of Canala. At the time I was covering the militarisation of indigenous Kanak villages in an attempt to suppress the struggle for independence. One of the problems was my book on the 1985 Rainbow Warrior bombing, Eyes of Fire, which was not popular with French colonial authorities. The Fiji crisis highlighted many dilemmas about culture and conflict. Customary obligations can be a burden on journalists. "The problem that arose here was not so much one of reporters taking sides, as it may have seemed at the time, but the inability of many reporters to function objectively under the pressures of the crisis. A lack of leadership in newsrooms was one reason." According to Agence France-Presse correspondent Michael Field -- who has had the biggest share of bannings of any journalist in the Pacific, having being shut out of Kiribati, Nauru, Tonga, and even Fiji at one stage -- the region has been going through something of an unprecedented crackdown against journalists. Student journalists have also faced victimisation over their reporting. Many incidents involving threats and attempted gaggings have impacted on USP student journalists working on their newspaper Wansolwara. But the "shooting the messenger" syndrome always had more serious consequences in Papua New Guinea. Two University of PNG reporters on Uni Tavur gave testimony last year before a commission of inquiry examining the causes of the shooting to death of four young Papua New Guineans during the protests against structural adjustment. While I was at UPNG, two senior Uni Tavur reporters were beaten up one night because of their front page report on a political dispute between two national student politics leaders, both from the province of Enga. On another occasion, drunken off-duty officers attacked a group of Uni Tavur students and me inside a police barracks. One student journalist was forced to go into hiding after he reported a funding scandal involving the then Miss UPNG. Rarely do Australian or New Zealand journalism schools encounter this degree of "direct action" over stories. For many Pacific Islands neophyte journalists, it is a baptism of fire. Not only does truth hurt, it can sometimes lead to a brutal act of retribution. It often takes raw courage to be a journalist in the Pacific. David Robie, former journalism coordinator at the University of the South Pacific who also taught in Papua New Guinea, is now senior lecturer in journalism at Auckland University of Technology.